Luxury Vineyard Living in San Rafael, Mendoza, Argentina. Heirloom-quality vineyard estates custom designed and built to your specification at a fraction of the investment of similar properties in Napa, Provence or Tuscany. The quintessential 5-star wellness, culinary and vineyard lifestyle community for the food and wine enthusiast, with stunning scenery and gorgeous year-round weather. Fun and adventure at the foot of the Andes! Championship golf and tennis, fishing, whitewater rafting, hiking, horseback riding, and the best skiing in South America. 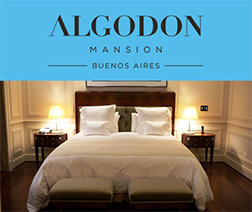 Nestled in the southern heart of Argentina’s scenic wine country, Algodon Wine Estates is a 4,138 acre (1,675 ha) resort and luxury real estate development with vineyards that have been cultivated since the 1940s. Now you can purchase Mendoza vineyard real estate at a mere fraction of the cost of comparable properties in Napa, Tuscany or Provence. Enjoy luxury vineyard living and world-class wine production, and leave the winemaking to us. Our celebrated wines are award-winning and internationally distributed, and are currently featured on the wine lists of multiple Michelin 3-Star restaurants. Argentina’s Real Estate Market is on the Rise! Find out why Argentina represents one of the most promising real estate markets in the world today. Diversify your portfolio with this solid growth investment opportunity. Great for retirement, a second home, or vacation retreat! Its no wonder San Rafael was recently named one of world's "best places to retire" by CNN Money! Creating a world-class wines are our pride and specialty. Our winemakers tend to the estate’s 70 year old vines with an artistry unique to only the most skilled winemaking teams. This is the same team available to tend your vineyards throughout the year. Our Bonarda wine recently ranked among the top 100 wines of the world 2014, while our Malbec recently received 91 points from Robert Parker’s the Wine Advocate. 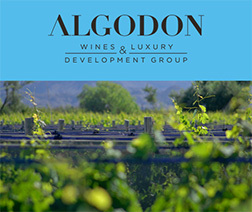 As the quality and reputation of Algodon’s ultra-fine wine collection continues to grow, we believe it may have a direct positive impact on the value of our vineyards for sale. 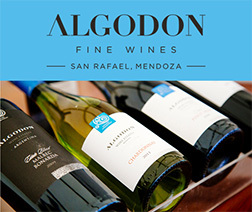 Algodon Wine Estate’s entry prices won’t last long; the time to buy is now. TripAdvisor Travelers' Choice® Winner, and among Frommer’s Best Vineyard Hotels Around the World! Enjoy modern amenities and authentic old-world charm, with delightful vineyard views. Chez Gaston features a traditional clay oven and flame broiling pit, and specializes in authentic Argentine gourmet cuisine. Floor-to-ceiling windows offer a unique view of olive trees, vineyards, and our manicured estate grounds. 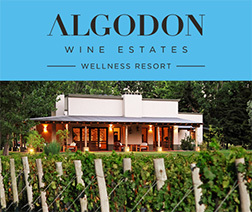 Many great golf courses and wineries exist in the world today, but nowhere are the two combined to create an experience like the one you'll find at Algodon, where the green literally plays through lush vineyards. This is as good as it gets. Read our hotel’s TripAdvisor reviews! Open Thursday - Sunday from noon until midnight.